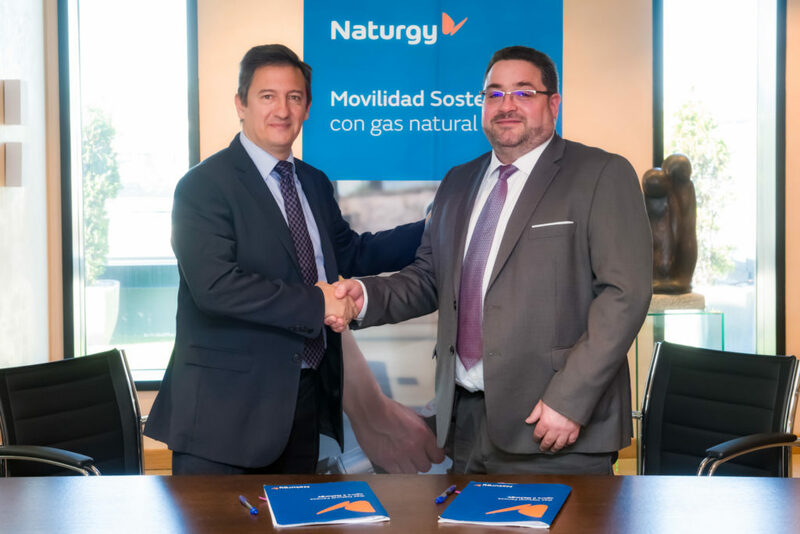 Naturgy’s director of Mobility Projects Alfonso del Río and Vallibria service station’s manager Adolfo Pérez Díaz signed an agreement for the construction of the first LNG/CNG public station in Galicia. The facility will be located at the Vallibria station in Martiñán (Vilalba, Lugo), on the N-634 highway, a strategic location due to its proximity to the A-8 motorway, the starting point of the Cantabrian corridor, ensuring the possibility of refueling to all the fleets in Galicia with destination to the north of Spain and France/Europe. The station will feature an LNG tank of 60 m3, one LNG dispenser and two CNG dispensers, and will allow the refueling of both light and heavy vehicles. This opening, scheduled for October, will give competitiveness to the Galician transport sector and will cover the lack of LNG infrastructure in the Cantabrian corridor with private initiative, since the A-8 is not included in the EU transport development projects, which have aids for the promotion of this type of infrastructure. The start-up of this new natural gas station is part of Naturgy’s sustainable mobility project, which aims to promote the use of natural gas for transport as the best alternative to fossil fuels derived from oil and to expand the station network in Galicia, as it will support the CNG stations that the company has in San Cibrao das Viñas (Ourense) and those that are currently under construction in Santiago de Compostela and Vigo. Naturgy (formerly Gas Natural Fenosa) is one of the main supporters of sustainable mobility and a pioneer in the promotion of natural gas in the Iberian Peninsula, a region that has experienced great growth in the adoption of CNG and LNG as transportation fuels. In this extremely encouraging scenario, AltFuels Iberia 2019 will take place on 11-14 June at IFEMA Trade Center, Madrid.